A big change in our weather, with bigger changes coming tomorrow. Sunny out and a high in the 50’s today, beautiful Fall Day out! Over the weekend we have a freeze warning out for Saturday and Sunday, tis the season! I love this Fall weather. Dad had a rough night breathing last night, a lot better today. He also started his home therapy today, which he needs. Went to Kroger for a few items for tonight’s dinner. Back home cleaned house today and cleaned up the leaves outside. Got the cart out for a while, had to wear a Sweatshirt the air was really cool. 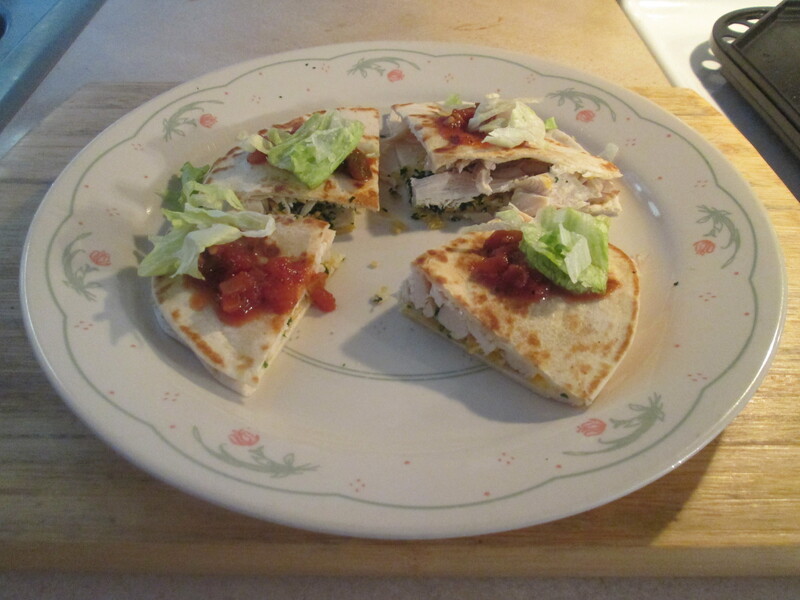 For dinner tonight I prepared Chicken Quesadillas and Refried Beans. I picked up a big and beautiful Rotisserie Chicken at Kroger yesterday and pulled all the meat off of it and had it in the fridge. 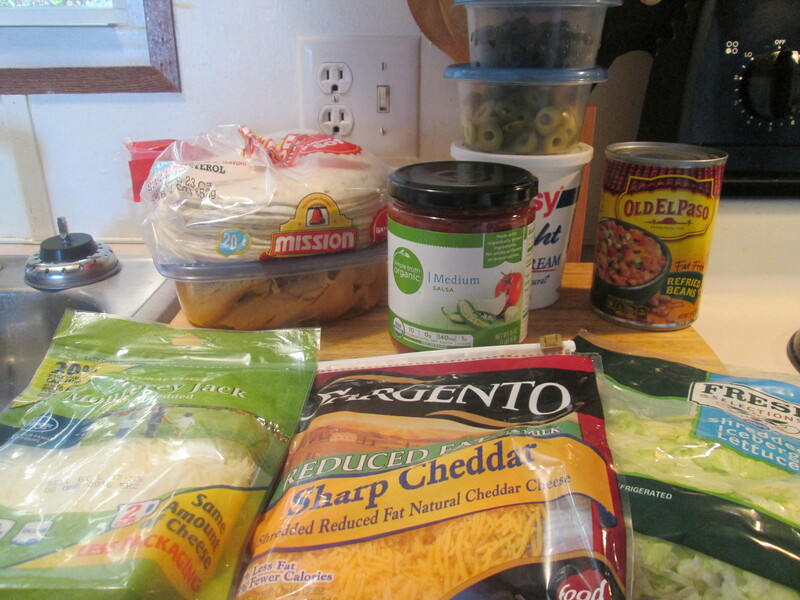 To make the Chicken Quesadillas I’ll need the following; 1 cup shredded Kroger Monterey Jack Cheese (about 2 ounces), 1 cup Sargento Reduced Fat Shredded Sharp Cheddar Cheese (about 2 ounces), Mission Extra Fluffy Fajita Flour Tortillas, Shredded Cooked Chicken (I used a Kroger Simple Truth Rotisserie Chicken), Chopped Cilantro, Sliced Black and Green Olives, Shredded Lettuce, Wholly Guacamole, Simple Truth Salsa, and Daisy Reduced Fat Sour Cream (last four items are for topping and optional). To prepare it I started by combining the Cheeses in a medium bowl. I then heated a large frying pan over medium heat until hot, about 3 minutes. Place a Tortilla in the pan and sprinkle with half of the Chicken, half of the Cilantro, Olives, and half of the Cheese Mixture. Top with a second Tortilla and cook until the underside of the bottom Tortilla is golden brown in several spots and half of the cheese is melted, about 3 minutes. Using a spatula, carefully flip the Quesadilla over and cook until the underside of the second Tortilla is crisp and golden brown in several spots and all of the cheese is melted, about 2 to 3 minutes more. 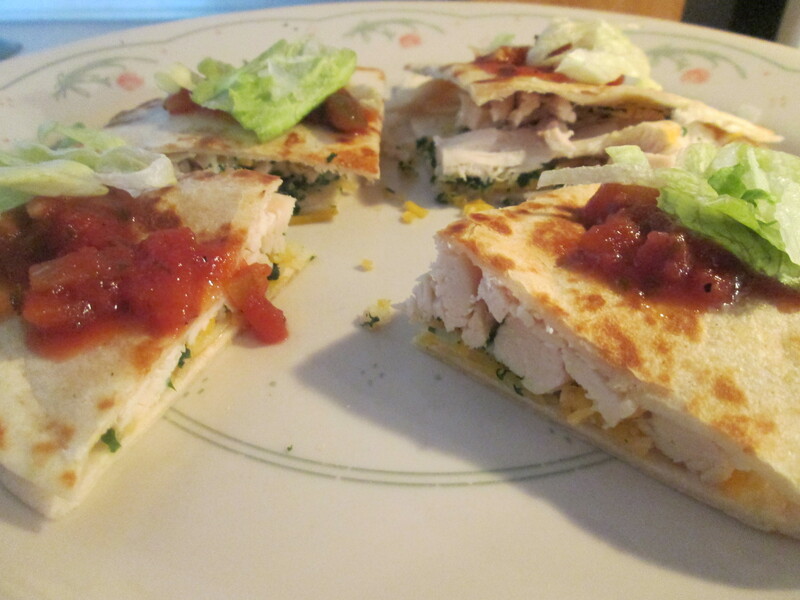 Then just slide the Quesadilla from the pan onto a cutting board and cut into wedges. Just repeat with the remaining ingredients to make a the other Quesadilla. Serve topped with Shredded Lettuce, Guacamole, Salsa, and Sour Cream, if desired. These turned out fantastic! The Chicken, Cheese, Olives, and toppings were a perfect mix! Then Mom and Dad wanted some Refried Beans also, so I opened up a can of Old El Paso Fat Free Refried Beans. 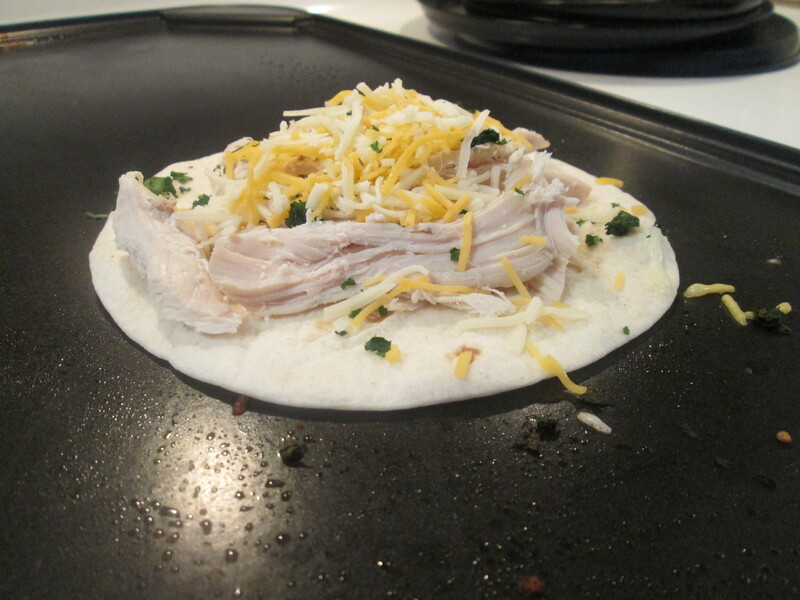 You could also use the Refried Beans to make Quesadillas with also! For dessert later a 100 Calorie Mini Bag of Jolly Time Pop Corn.